The evil Lord Zedd, and his unusual wife Rita Repulsa, scheme to take over Earth by releasing a powerful villain from a hidden lair to destroy the Power Rangers. Unfortunately, they bit off more than they could chew, and after destroying the Ranger’s Command Center, the slimy Ivan Ooze turns his attention on Rita & Zedd, entrapping them inside a snow globe! Their powers lost and their mentor’s life hanging in the balance, the powerless Rangers make a desperate attempt to reach the distant world Phaedos, where they might be able to find a new power to counter the diabolical Ivan Ooze. Upon their arrival, they are confronted by many dangers in their quest to find the Great Power, including befriending the ancient-yet-beautiful female warrior Dulcea. Meanwhile, Ivan has hypnotized all the parents of Angel Grove, California to dig up his own two powerful Ectomorphicon Titans; leaving all the children helpless to watch. After passing several combat trials, the six Rangers reach and receive the Great Power, and then return to Earth. They arrive just in time to see the two Ectomorphicons wreaking havoc on downtown Angel Grove. The Power Rangers summon their new Ninja Zords from the sky, and separate to deals with the two evil Zords. When one of them is destroyed, Ivan implants himself directly into the surviving Ectomorphicon, and forces the Rangers to combine their Ninja Zords to become the Ninja Megazord. After pursuing him into space, he is destroyed by a nearby comet, and the Rangers return victorious to save Zordon from death. The plotline from “MMPR-TM” is based loosely on the debut for the third season of the television series “Mighty Morphin Power Rangers”, but they have no continuity between each other even though they both involve a quest for the Great Power, Ninja Zords, and the same cast from the previous year. 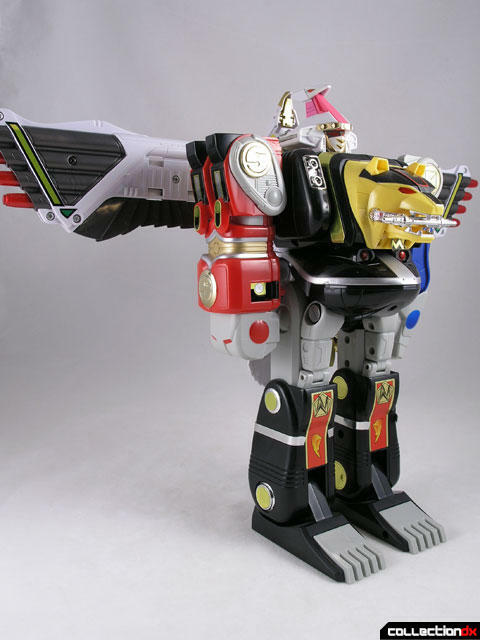 The Ninja Megazord and the various Ninja Zords from the movie were not stunt suits or models used on a set but computer-generated (CGI) figures only, as were the evil Ectomorphicons. As such, it had very little resemblance to the practical models used in the series. 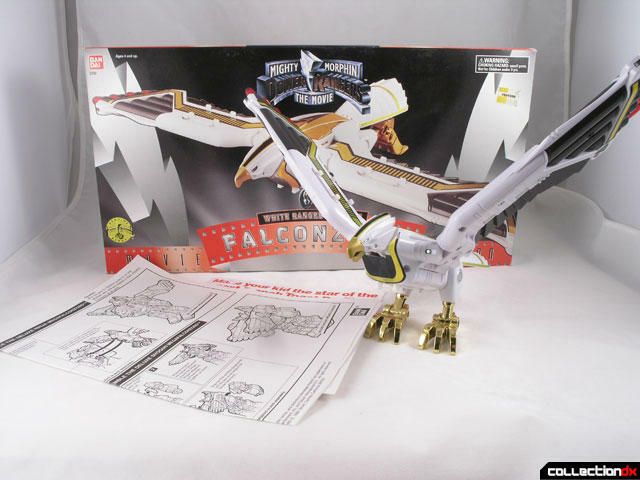 So, even though this is the Movie Edition of the Falcon Ninjazord, it is no different from the regular Deluxe version that was seen in the TV series. If you want to learn more about this robot, and its role in MMPRS3, you should check out their Wikipedia entry – they know more about it than I do. What I can speak with authority about is the toy. 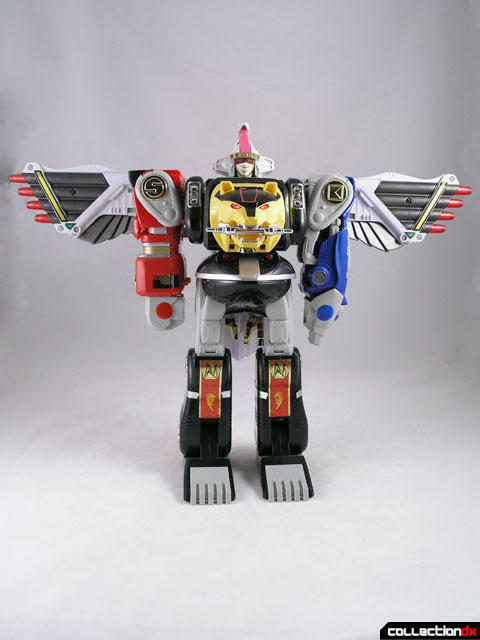 The Deluxe Movie Edition Ninja Megazord was released in the summer of 1995 to coincide with the release of the Power Rangers Movie. These toys were identical to the toys released for Mighty Morphin Power Rangers Series 3, which were released earlier in the year. 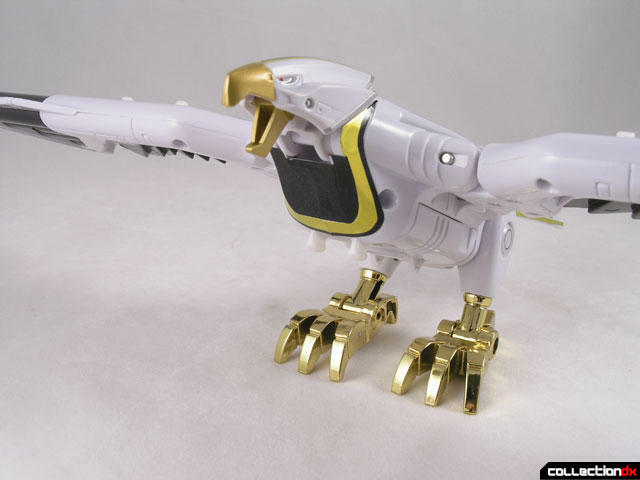 On its own, the Ninja Falconzord does not have a lot of play value. This large bird has moveable wings, claws, head and jaw. The real value of this toy is in the way that it combines with the Deluxe Ninja Megazord and the Deluxe Shogun Megazord. 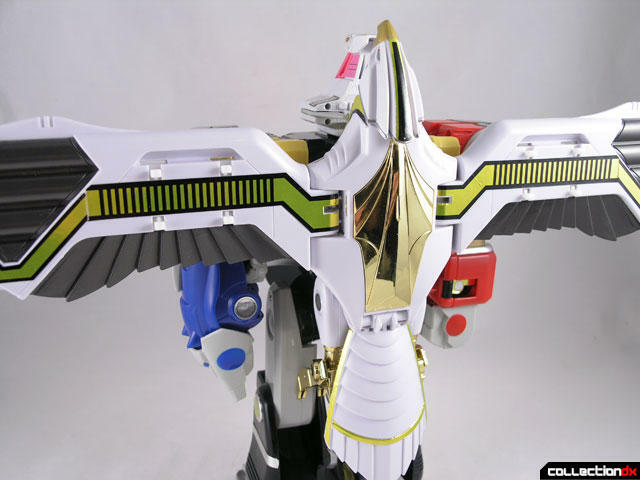 When combined to the Ninja Megazord via pegs on the back, it Becomes the Ninja Mega-Falconzord. 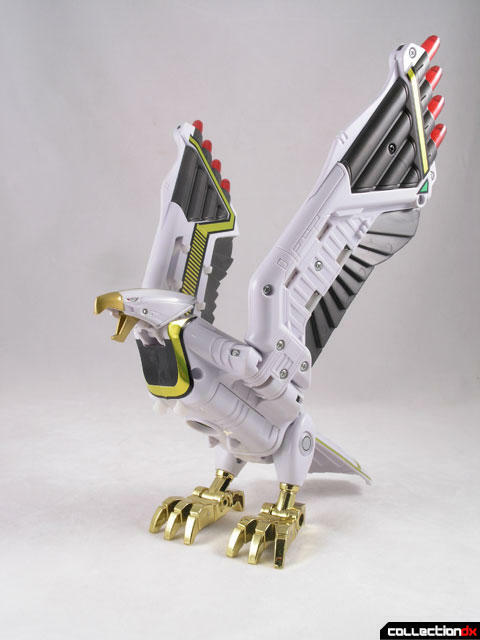 The Falconzord also combines with the Shogun Megazord to become the Shogun Mega-Falconzord. The original Japanese release of this toy, the DX Tsubasamaru (DX ツバサマル) featured battery operated lights and sounds. The switches have been eliminated for the US release, but the battery compartment remains. You covered BOTH of them!!? I wasn't talking about the Tsubasamaru. I was talking about how- at the time- JoshB covered both the movie-exclusive Falcon Ninjazord and movie-exclusive Dlx Ninja Megazord... both of which I have. Oh I see, sorry my bad. Though i wouldn't mind seeing the Movie versions in action in a video by you. Hopefully you'll do that in the future perhaps?